Here we are, trying out their 6-course set dinner at $49++, which has to be pre-reserved as there are limited ingredients from Japan. 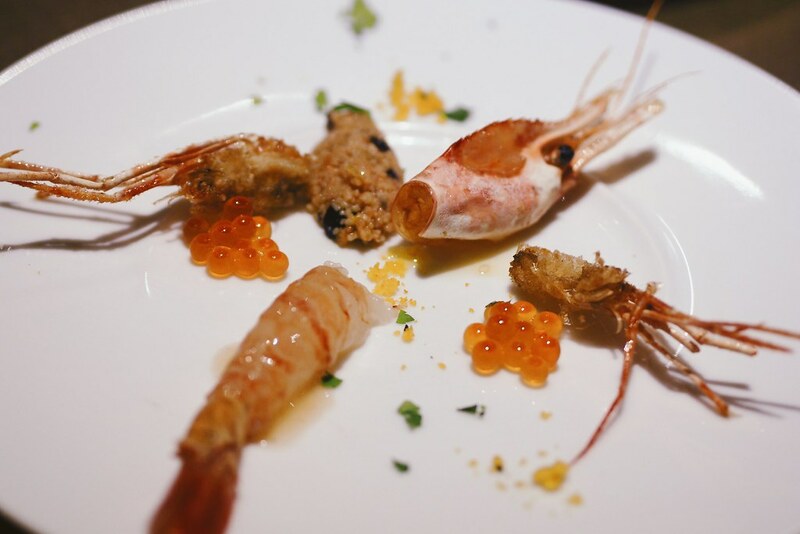 We started off the dinner with Marinated Botan Shrimp and Couscous Salad with Tosazu Vinegar and Salmon Roe. 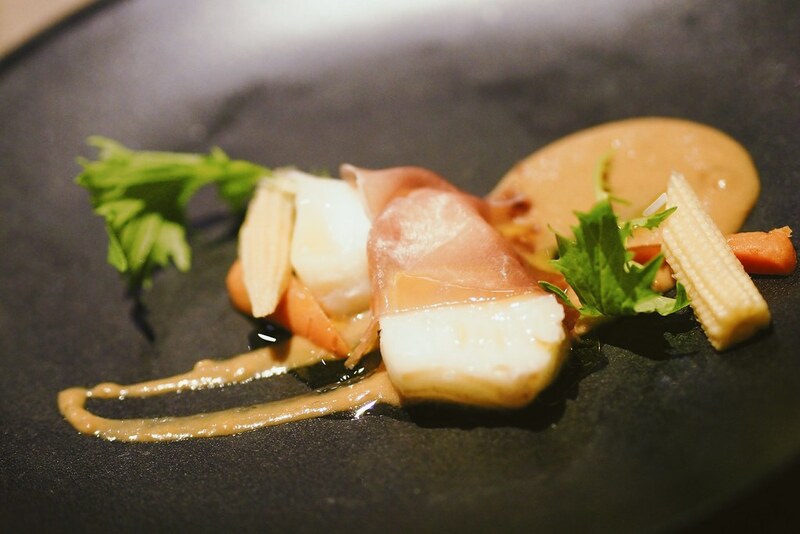 The shrimp was really fresh and nicely marinated with Tosazu Vinegar, a mixture of soy sauce vinegar and bonito flakes to give it that robust flavour. 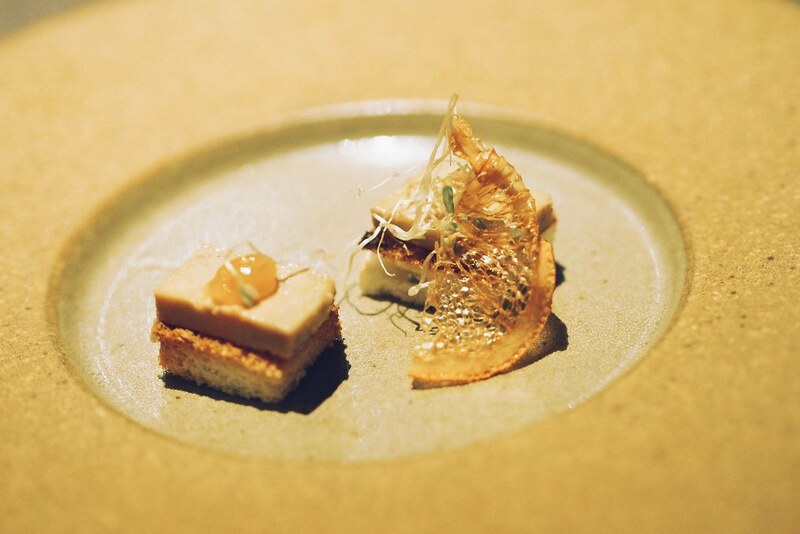 Foie Gras Terrine and Bruschetta was presented in a dramatic-style where the dish was filled with smoked orange jam. The citrus scent is a mood-booster and helps to whet the appetite as well. The only downside of this dish is probably the portion size, which was barely a mouthful. 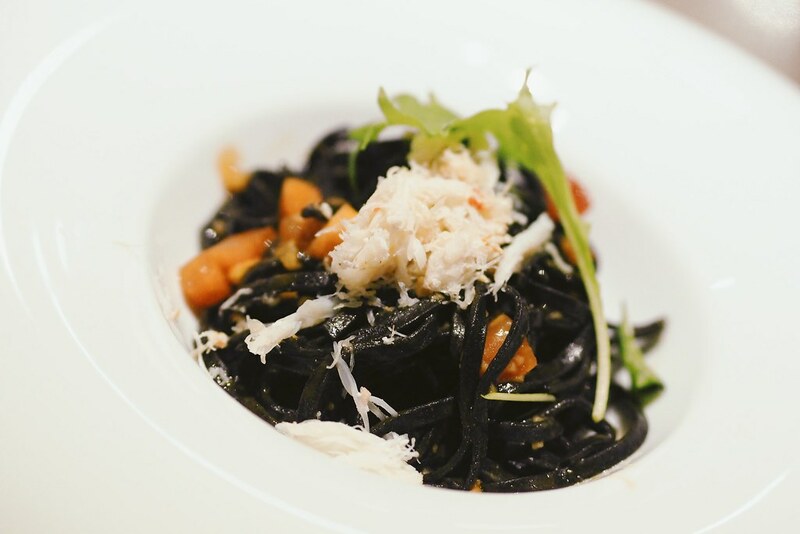 Moving on, we had Garlic Flavored Squid Ink Tagliolini Topped With Snow Crab as one of the main dishes. Chunks of snow crab were generously sprinkled on top of the pasta. This was my favorite dish compared to the rest. Steam Cod Fish Rolled With Parma Ham Porcini Cream Sauce was the second main dish. Again, the portion size was a letdown. The fish was surprisingly soft, which was a pretty uncommon texture for cod fish. If not for the parma ham, it can get a little too bland. Honestly, I had mixed feeling for this dish. 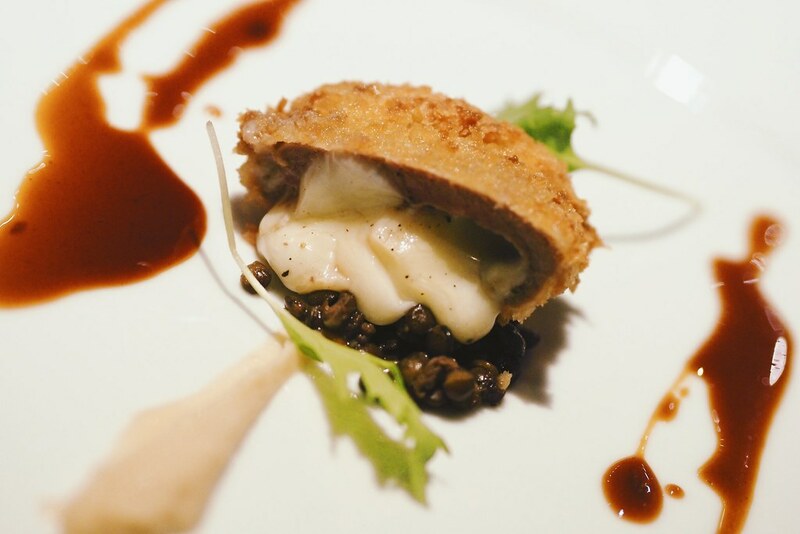 The Mozzarella and Lamb Tender Loin Fritto with Celeriac Puree & Japanese Pepper Fond De Veau Sauce was the final main dish. Presented with its cheese oozing out, I didn’t quite like the meat as the distinctive lamb flavour is too strong. Creme Brulee With Raspberry Sorbet was the dessert of the day. 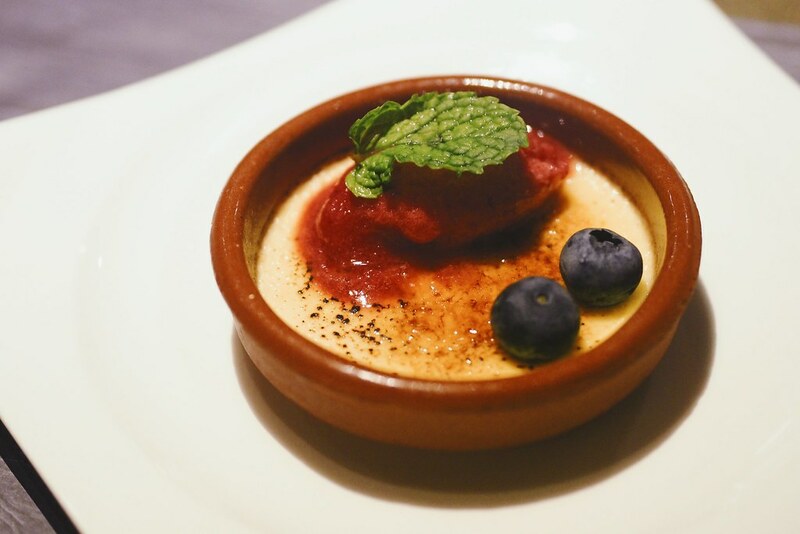 The creme brulee was nicely charred and paired with a delicious scoop of sweet and sour raspberry sorbet. Lots of hits and misses for this menu, wish they would bring back the good old stuff. 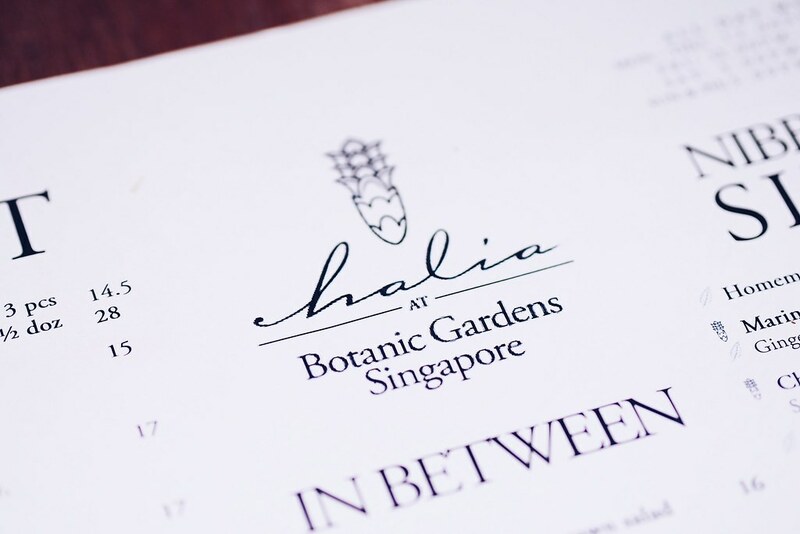 The Halia at Singapore Botanic Gardens is now halal certified! 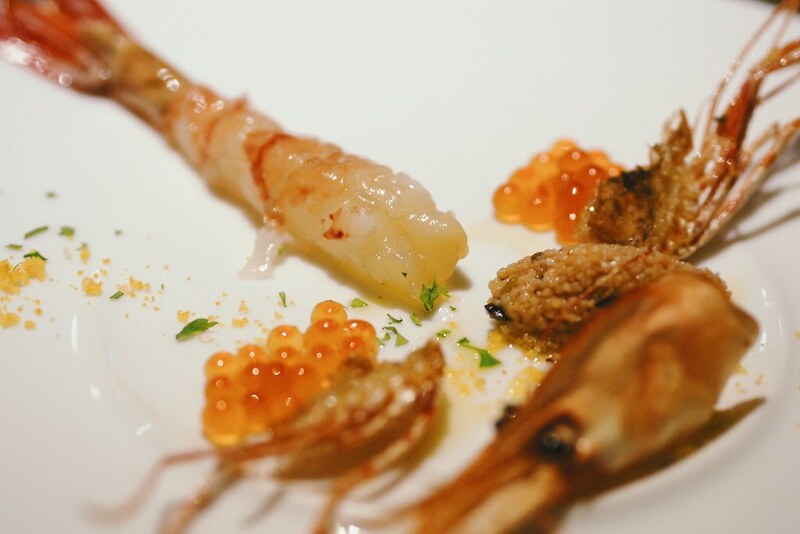 Now an inclusive dining destination for the masses, the restaurant has also revitalised its all day ala carte menu with spectacular new dishes. Many would think that The Halia’s price point is on the expensive side but it isn’t. 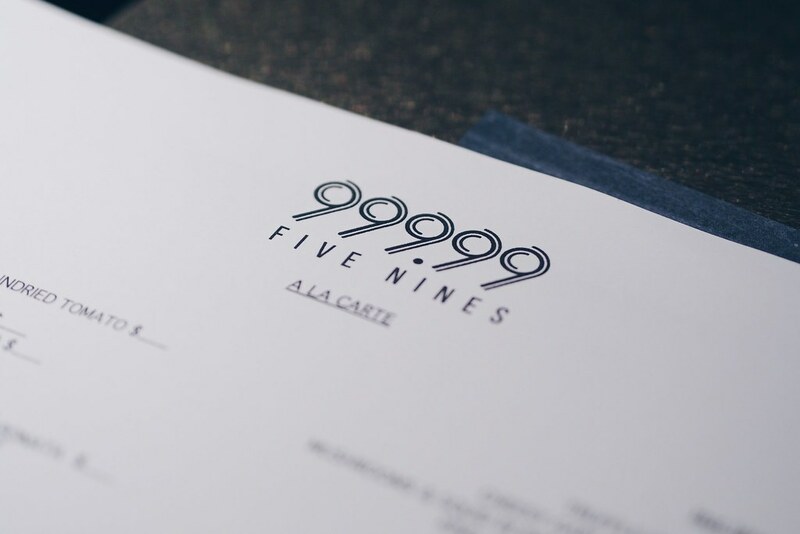 The menu has been revamped and featured quite a number of impressive dishes. I started the meal with a glass of Lychee & Thyme ($8++), a refreshing concoction of healing garden tea, lychee juice, thyme infusion and raspberries. 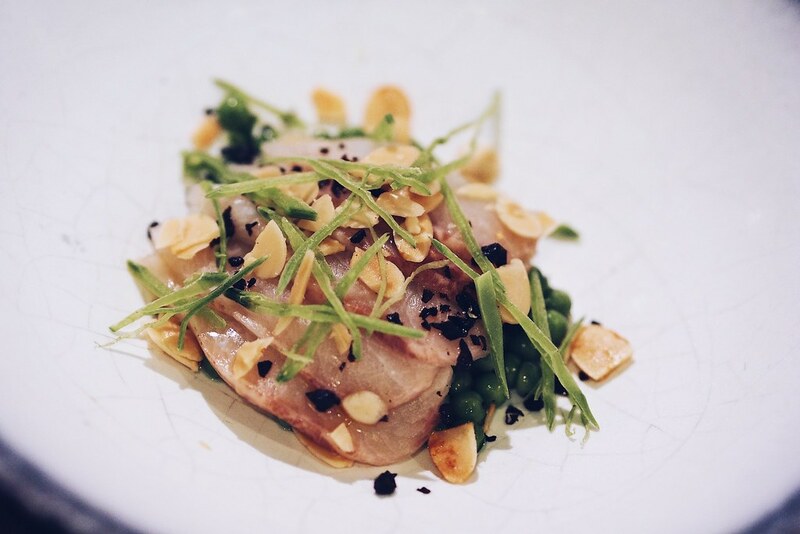 Lightly Smoked Kingfish ($17++) is served with smoked crushed pea, lemon dressing, almond flakes, salted black beans and lemongrass oil. 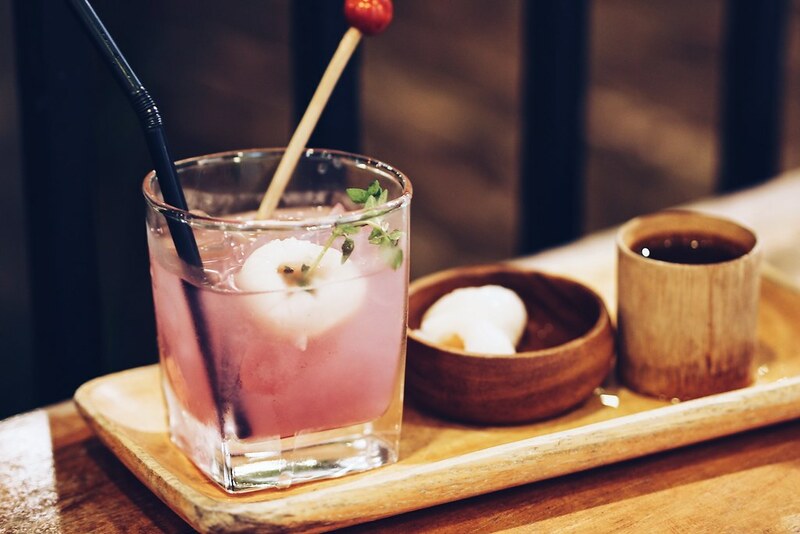 It also comes with a side of chilled cucumber and ginger shooter mixed with yogurt to give it additional flavours. 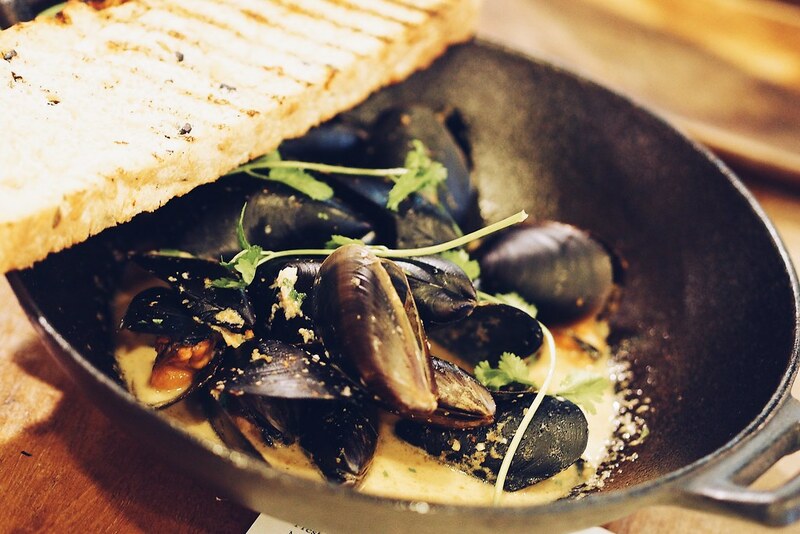 I pretty enjoyed the mussels from Fresh Boston Bay Mussel ($22++) which are plump and juicy. The coconut & ginger flower broth added with chilli and lime have such an intense flavour which makes me crave for more. Dipping the grilled focaccia into the sauce makes it even more satisfying as it had soaked up most of the broth. 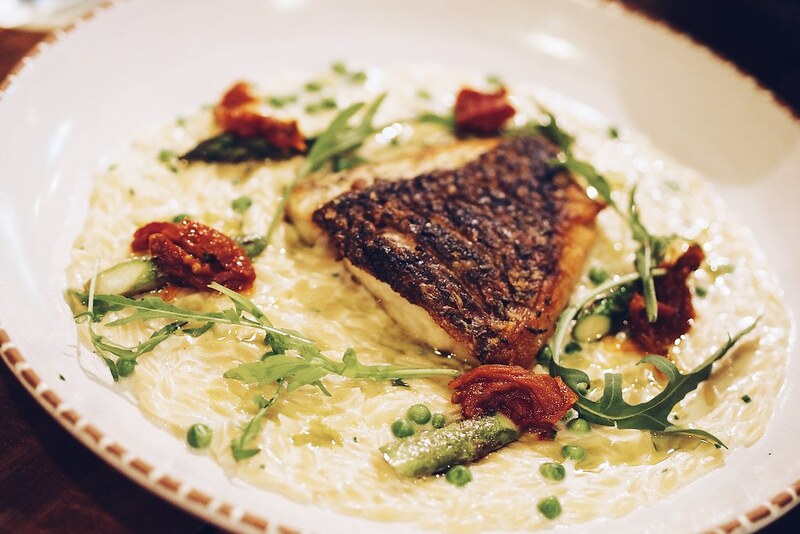 Pan-fried Barramundi ($28++) topped with green asparagus, cherry tomato and basil oil reminds me of risotto, but the pignolina pasta is much more chewy. It had absorbed most of the thai coconut cream sauce which makes it a delight to chew on. The barramundi was really fresh and nicely charred on the skin. 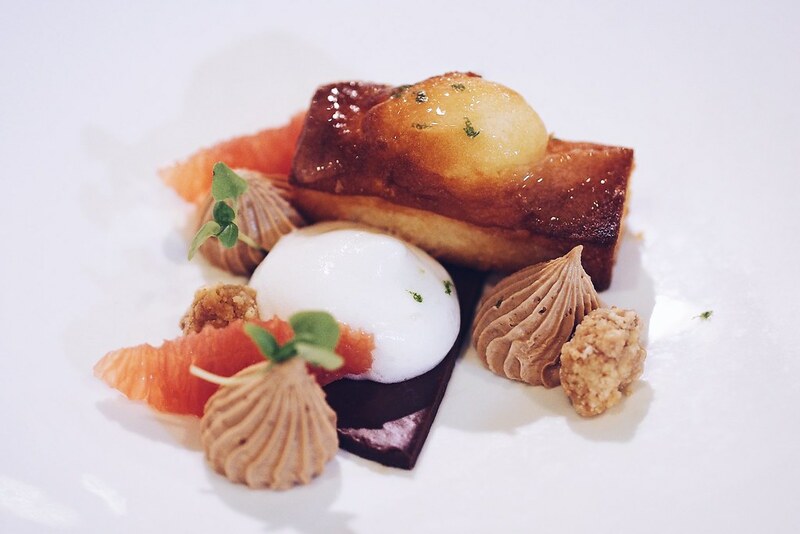 Yuzu Gateaux ($13++) is made with a yuzu infused cake, intense chocolate yuzu ganache, lait caramel mousse and yuzu foam. If you love something sweet and sour, this is definitely for you. I had mixed feelings for Fig Tart ($11++) as I am never a fan of figs. 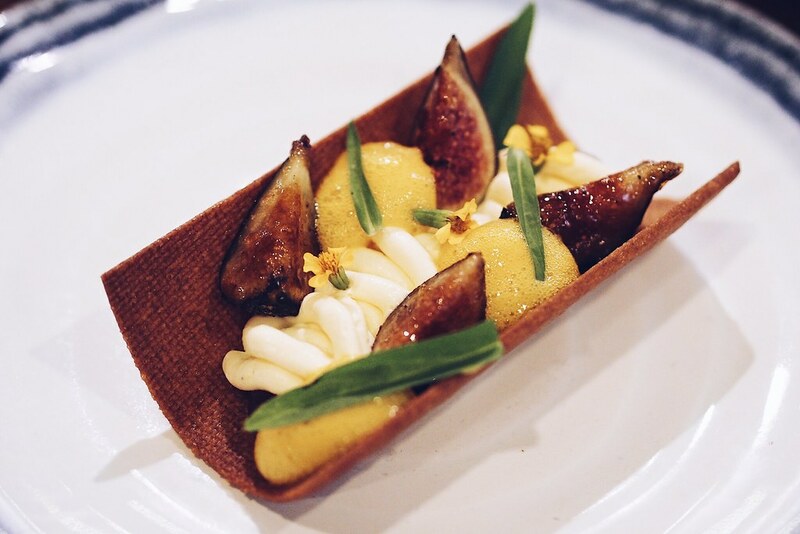 Sitting on a bed of chocolate tart base was yogurt mousseline, speculoos, caramelised fig and turmeric foam. Forget about the figs, the rest of the tart was tasty and great on the palate. Also, I was blown away by the pretty presentation of this dessert, never knew tarts could look like this. Note: Prices are subjected to 10% service charge and prevailing government taxes.